It seems that we’re on an all-american kick right now! 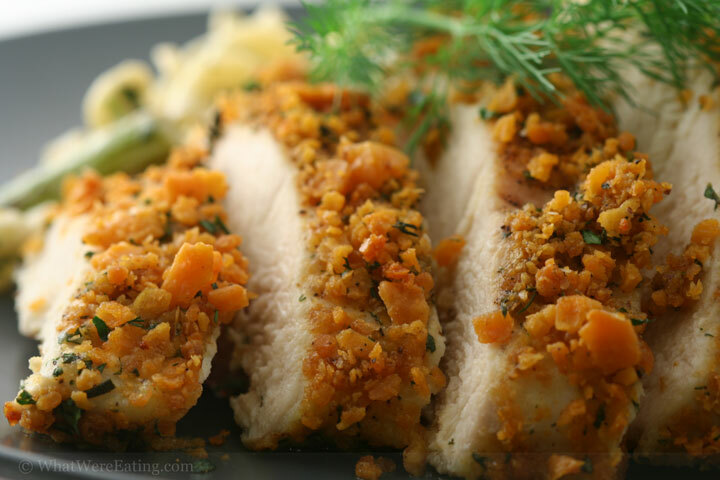 For dinner we’re eating baked chicken breasts encrusted with a hot-sauce, cheezit, and fresh herb mix. The chicken breasts were sliced and served with an herb, roasted asparagus, red onion, brussels sprouts, and fresh tomato pasta salad. Overall it was some simple-to-make yet mega-tasty food. 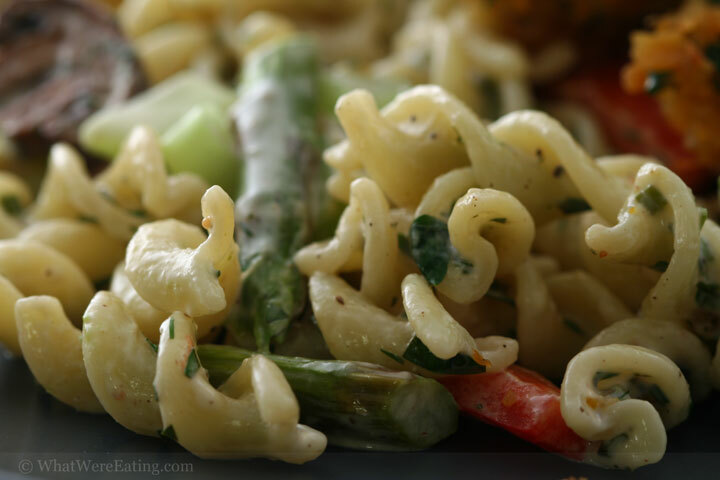 A tasty pasta saladA: yeah… that’s right! i encrusted something in cheezits! so what? i happen to love cheezits. T: hey, i didn’t say anything. I think it was a good idea. people encrust things in crackers all the time, and guess what? cheezits are top-notch crackers. A: too true. unfortunately for me i didn’t have any hot-n-spicy cheeseits available so i had to make the hot-n-spicy myself…. the crumbs were tossed with louisiana brand hot sauce. T: i’m glad you didn’t use the pre-seasoned cheezits for cooking. that seems like it would be bad… they’re good for snacking, maybe not so good for cooking. The plain cheezits were fantastic though. A: they were just cheesey enough to let the hot sauce and tons of fresh herbs shine through. it really did have a great flavor. the chicken was soooooo moist. T: yeah, the chicken was cooked to perfection. And I really loved all the dill flavor. Dill is great, but I usually only taste it in things like dill chips. Seriously, people don’t seem to cook with it too much. Am I right? A: heheheh uh… no… not so much! people cook with it a lot. maybe you just aren’t choosing options containing dill when you’re eating out. there is always the classic pairing of salmon and dill. that’s way overplayed… but for a good reason. they really do taste great together. T: yeah, i was gonna say, I don’t think great food combos can really be overplayed. If it’s good it’s good. T: apparently cheezits and herbs are a pretty good combo. I enjoyed this meal. I give it a 4.72/5. The chicken was cooked perfectly, the cheezits were a creative way to encrust the chicken, the dill really shined, and the meal as a whole including the pasta salad meshed together well. Good stuff. What’s your rating? A: well, this was definitely an all american meal. housewives in nebraska have probably been encrusting chicken w/ cheezits for ages and i would have to say they’re on to something. all the fresh herbs, both in the cheezit crust and the pasta salad really set the meal off for me. I’m gonna have to give this meal a 4.37/5. It was damn tasty, quick, and something anyone can make. so simple, yet so tasty. T: definitely tasty. wow… your feet stink. A: heheh yeah! i wore nasty shoes w/o socks! enticing, eh? T: woman. what am I gonna do with you? i guess get you some socks. Recipe serves 2 but can easily be doubled or tripled. Preheat oven to 400 degrees. On large plate add the first 8 ingredients. Stir to combine thoroughly. Place the flour in a second plate. Season w/ kosher salt and freshly cracked black pepper, stir to combine. To a wide bowl add the egg and 2 tbsp hot sauce. Whisk until the egg is frothy. Season all sides of the chicken breast with kosher salt and freshly cracked black pepper. Dredge the breasts in the flour, shaking off all excess. Dip the lightly floured breasts, on at a time, into the hot sauce and egg mixture, coating both sides. Next, press each of the breasts into the cheezit-herb mixture, making sure all sides are thoroughly coated. Place the Cheezit encrusted breasts onto a sheet pan. If there the crust isn't sticking, press a little bit of the Cheezit mixture onto the top of the breast once it has been placed on the sheet pan. Place the pan into a preheated 400 degree oven. Bake the breasts at 400 degrees for about 20-25 minutes or until just cooked through. Removed the cooked breasts from the oven and allow to cool for about 10 minutes before slicing and serving. Enjoy! We totally love your recipe post – way cool and the recipes are something different yet something we would feel comfortable doing. Sweet… That’s not always the case. I hope you don’t mind – I linked you some time back on our blog… You guys rock. thanks so much fm! and of course we don’t mind you linking to us! 😉 i really like easy, so that what i tend to go for when i cook. frequently it’s time consuming… but always easy! only cracker that MIGHT be better than cheezeits (althrough cheezeits DO rock) would be Better Cheddars…a deeper cheddar flavor and a lighter, crispier, slightly more oily version of a cheezeit. I could eat a whole box of either. oh, and i’d also eat anything slathered in hot sauce. like my arm. maybe not your stinky feet. but definitely my arm. i want to be encrusted with cheez-its. that would be redundant though, a cracker wrapped in crackers, i might cancel myself out. Hooray for cheez-its!! I hardly ever buy them anymore because I seriously can’t stop eating them! My favorites are the Big Cheez-Its! I really want to try this when I have a kitchen again! Actually, since I’ll be in San Diego soon you’re more than welcome to make it again and invite me over…hahahaha! Amanda, I love th idea of encrusting the chicken in cheez-its! I’ve done chicken in cornflakes, but have never thought of using my favorite snack cracker. I can’t wait to try it! I miss you guys and can’t wait to see you in December! hehehe… leena, you don’t think hot sauce would be potent enough to cover up my stinky feet?!? hmmm….i think you’re right! now fill me in, are better cheddar crackers in the shape of ducks and animals? for some reason when i hear that name i think of animal shaped cheddar crackers… mmm, maybe that was quackers! regan, we miss you too! it’ll be no time before december’s here and we’re there…. hmm, that is if we get around to getting plane tickets! we are soooo bad about stuff like that! i bet the kids would eat the chicken and cheezit combo! That looks really good! I think this just might be what it takes to get my 3 yr. old to eat chicken. I never realized there was a world of foodies out here in the San Diegan area..Glad to find y’all and hope you fared well with these fires. thanks laurie! i hope you and your family fared well… as well! How about a cheezit crust for a smoked gouda, thyme, sun dried tomato cheese cake? I’m passing those at my next pool party!! And Eric Estrada will be there!!! oh my goodness, you are officially brilliant. Can’t wait to try it tonight! RF Cheezits are the snack of choice at my house, so I googled Chicken and Cheezits and your recipe stood out from all the others. My daughter always warns me to make small quantities (and with good reason, I might add!) when I try something new, but I think even SHE will devour this one! The chicken sounds great. I would love to have your pasta salad recipe too. I am a pasta salad maniac, and it sounds like a perfect side for this chicken. Oh my gosh! I tried this recipe one night with my family and they absolutely could not believe how good it was! It was the perfect blend of cheese, spices, and chicken. I will DEFINETELY make this again. Awesome recipe! That’s okay to encrust chicken with Cheez-its. I was a the fresh & easy market and a lady gave me a mac & cheese recipe with chicken cutlets and cheez-its in them. It was very tasty. It was good. I make this a lot for my family. It’s an absolutely wonderful recipe! Never would have thought of doing something like this myself, but I sure am glad someone did! YUMMM!!!! I just made this and it is DEEEELISSHH!!!!! Only difference was I had to use dried herbs, just used about 1/3-1/2 of the amount it asked for. Also, I am not a spicy food person so I only used 1 tbsp of hot sauce, which is PERFECT for a nice tangy spicy kick without being overwhelming. LOVE it, will definitely make this again!